On February 9, 2019 Mrs. Lena Faryna of St. Paul passed away at the age of 93 years. She is survived her 2 sons, Melvin (Dolores) of St. Paul & Cary (Jeannie) of Kamloops, B.C. ; 6 grandchildren, Kevin (Denise), Cheryl (Curtis) Paulichuk, Kelsey (Leah) & Janelle (Brendan Comerford), Jordana (Dylan) Shier & Ali (Andy) Unger; 5 great-grandchildren & one on the way, Ty, Harrison, Kiera, Nolan & Autumn; brother, Jerry Bugera of Mannville. Lena was predeceased by her 4 sisters & 4 brothers. Celebration of Life will be held on Saturday, February 16 at 12:00 p.m. at Centennial Seniors Centre, St. Paul with Pastor Kelly Sibley officiating. Cremation has taken place with inurnment in Elk Point Western Cemetery, Elk Point at a later date. If desired, donations may be made to Haying in the 30’s (Cancer Support Society) c/o 5626 – 51 Street, St. Paul, AB. T0A 3A1. 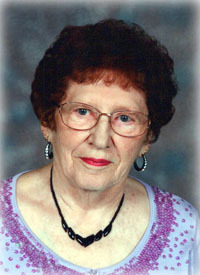 To send condolences online, please visit www.gracegardensfuneralchapel.com. Relation: She is m my uncles mother,my aunt's mother in law and my cousin's grandmother. So sorry for your loss. My condolences to all the family. Melvin & Cary, our deepest sympathy to you and your families. My sincere condolences to you Coby and your family. My thoughts and prayers are with your families on the loss of your Mom and Grandma. I have fond memories of Auntie Lena’s visits to our home sitting around my parents (Eric & Helen) kitchen talking, laughing and enjoying life. My memories of her will always make me smile. I regret that we can’t be there today but we are thinking of you and your families today Melvyn and Carrie.